UofL strives to provide professional development in sustainability, compensate employees fairly, provide for basic needs, promote health & wellness and treat everyone with dignity. UofL actively seeks to be a truly Great Place to Work, where faculty and staff are treated fairly, given a voice in governance, and encouraged to get actively involved in making the University a place of ever greater health, wellness, and sustainability. 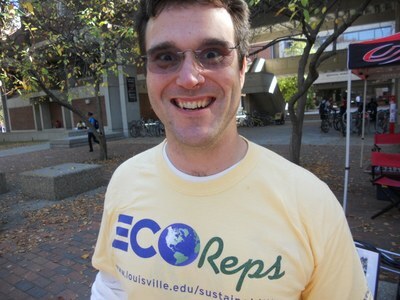 Free online and in-personsustainability training is available year-round through the UofL EcoReps Program. In spring 2014, the university made free, UofL-specific, online Sustainability training available to all faculty and staff through Blackboard's University Wide Training Resources. In April 2012, UofL launched a new Professional Development Training Program with sustainability training open to all employees at least once a semester. This dynamic and engaging series of sessions led by experts in the field provide all employees with a helpful introduction to the basic principles of sustainability and how to apply them in professional and personal decision-making at work and at home. This on-going series of professional development sessions has been designed to offer staff and faculty at any level with a wide variety of practical tips that you can use to help UofL shift our culture towards become better stewards of the environment while saving money and helping build a brighter tomorrow for society. Attendees will better understand UofL's commitment to sustainability and learn how each step we take contributes to big results for us individually, for the university, and for the broader community. The sessions will also introduce you to UofL’s Eco-Reps Program, which gives you the opportunity to go deeper with follow-up trainings online, a certification, group and individual service projects, and the empowerment of becoming a point-person for sustainability in your unit. Registration and details here. In Fall 2012, the Sustainability Council launched an Eco-Reps program, providing in-depth campus sustainability training and certification for all students, faculty, and staff willing to become a point-person for peer-to-peer mentoring about sustainability in their building, unit, department, or residence hall. Interested persons should contact Brian Barnes <brian.barnes (at) louisville.edu>. More details here. From July 2009 to April 2016, every Monday’s day-long New Employee Orientation (required for all full-time university employees) included a module on sustainability at UofL and the Partnership for a Green City. When the program was cut to a half-day, this in-person training was dropped, but all new employees are still given information in their welcome packet about sustainability at UofL. All are encouraged to sign the Cards Go Green! Pledge, committing to at least three actions to reduce their environmental impact; and encouraged to look for ways they can help the University enhance its sustainability as they settle into their new positions. Sustainability information is also distributed during July’s New Faculty Orientations, including the Cards Go Green! Pledge and details about specific projects faculty and students can get involved in to help transform UofL into a living laboratory for sustainability. Our Get Healthy Now (GHN) program promotes university-wide wellness through a wide variety of initiatives. GHN regularly celebrates the successes of UofL employees and secures awards & recognitions for the University in many capacities. 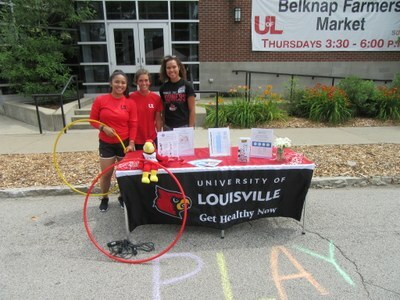 In 2010, UofL was honored as Louisville’s Healthiest Employer in the 5,000+ employee category and received an award for being the Most Physically Active Worksite based on participation in Kentuckiana Metro on the Move's Fall 2010 Challenge. This policy applies to the University Community (administrators, faculty, staff, and students) and all visitors, including contractors and event attendees. Tobacco refers to any and all tobacco products, whether inhaled or ingested, as well as electronic cigarettes and vaporizers. Tobacco products include the use of cigarettes, e-cigarettes, cigars, pipes, smokeless tobacco, vaporizers, hookahs, and similar type products. Monthly Happenings & Highlights communicate the comprehensive offerings of the GHN program. Learn more about our programs and offerings.Up-to-date information can always be found on the GHN website and via Facebook and Twitter. April 3 - May 8, 2012: Fridays, 11:00 a.m.
July 6 - August 10, 2012: Wednesdays, 2:00 p.m.
August 2 - November 6, 2012: Thursdays, 12:00 p.m. The class was designed as a guide to various aspects of safety, such as basic equipment maintenance, skills, and rules of the road. 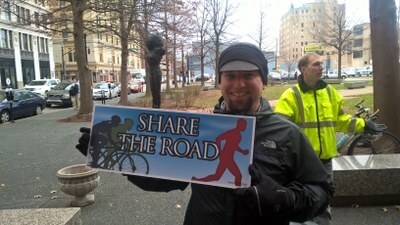 The content was based on the League of American Bicyclists' national BikeEd program. This central idea of this class was "Cyclists fare best when they act and are treated as drivers of vehicles." Safe Cycling was intended to help you to become a cyclist who rides with greater safety and confidence. Get Healthy Now encourages participants to ride bicycles for fun, fitness, and transportation, leading to a happier and healthier person, planet, and safer environment for all. These new bike safety classes were made possible by funds generated through the purchase of "Share the Road" license plates by Kentucky motorists! In November 2013, UofL became the first public Kentucky university to establish a living wage when it increased its minimum salary for regular status staff employees from $8.67 to $10 per hour. More than 150 employees benefited from the salary increase, which represented a 15% raise for our lowest paid employees. In February 2014, former Provost Shirley Willihnganz approved a proposal to increase UofL's minimum wage by 25 cents per hour per year for the following four years, starting July 2014 and continuing through 2017 – bringing the rate to $11 per hour by July 2017. Defined as the minimum hourly pay necessary for employees to afford the average cost of living in their community, including housing, food and transportation, the living wage varies by location. Employees earning the minimum will be eligible for additional compensation if, in a given year, the university’s total salary pool for the year exceeds the living wage adjustment for that year. As of 2018, the Living Wage Calculator developed by MIT estimates the following as Living Wages for workers in Jefferson County, KY. The Living Wage shown is the hourly rate that an individual must earn to support their family, if they are the sole provider and are working full-time (2080 hours per year). All values are per adult in a family unless otherwise noted. These figures show the individual expenses that went into the living wage estimate. Their values vary by family size, composition, and location. "The first public university in Kentucky to implement a living wage, UofL once again is leading the way among higher education institutions. We have been the leader in implementing Kentucky’s higher education reform. We were the first to develop diversity plans, the first to provide health insurance to domestic partners, the first to follow the minority and female hiring practices of the Louisville Arena Authority and the first to partner with our local public schools and Simmons College of Kentucky to address education gaps by developing a meaningful clinical model of teacher education. The establishment of a living wage is just another reason it’s great to be a Louisville Cardinal." "Competitive compensation to university employees is an important priority in the University of the 21st Century Initiative. Over the past several months, many groups within the university have worked to establish an equitable compensation plan to distribute funds set aside for this purpose. The priority for both staff and faculty adjustments has been to bring employees who are furthest behind their respective market salary closer to the market. Funding in the amount of $2 million, plus additional dollars to pay salary-related benefits such as retirement contributions, is included in this year’s budget to address salary equity. The funding will be split evenly between faculty and staff. Beginning January 2017, adjustments will appear in the paychecks of those affected. These adjustments reflect a continuing and recurring commitment on the part of the university. Below is a summary of the process followed to determine equity adjustments. Human Resources completed a staff salary survey in early 2016. High quality, reliable data sources were utilized to do a competitive market analysis. This work allowed HR to identify market reference points for over 98 percent of our staff positions. In consultation with the Staff Senate Executive Committee, HR developed a plan that brings the compensation of all staff to at least 81 percent of the market reference point for their position. Just over 10 percent of staff - 399 employees - are affected, and the average salary increase is $2,469. Active employees who began on or before June 30, 2016 and who received a satisfactory or better performance review are eligible. The Office of Institutional Research and Planning conducted an analysis comparing faculty salaries with those at a peer group that included Atlantic Coast Conference public universities and institutions designated as benchmarks by the Kentucky Council on Postsecondary Education who participated in Oklahoma State University’s (OSU) annual faculty salary survey. The OSU survey was the source of benchmark salary information, with the exception of Libraries faculty, for whom a different data source was used. Faculty in School of Medicine clinical departments were not included in the survey. After input from faculty and deans, the provost’s office, Institutional Research and the Vice Provost for Faculty Affairs developed a compensation model that took into account a faculty member’s academic discipline, academic rank, time in rank, highest degree earned and current salary relative to that individual’s respective benchmark median salary. The provost’s office used calculations from the model to determine the amount of money available for distribution in each unit. Deans then had the option of allocating funds based on other considerations - including productivity - and/or according to unit rules for salary adjustments. A total of 409 faculty are affected, and the mean salary increase is $2,445. To be eligible, a faculty member must have received satisfactory annual performance reviews in each of the last 3 years and a satisfactory periodic career review, if the latter is applicable. The Board of Trustees has supported this initiative and the university is committed to continuing these adjustments to bring the salaries of university employees closer to their market rates." The Living Wage policy adopted in 2013 did not apply to people who work on campus for contractors like food services, the UofL Bookstore, and certain custodial, security and printing services. The Sustainability Council advocated for the extension of the policy to all contract workers as well, and in fall 2015, the student group Cards United Against Sweatshops joined the struggle: Cards United Against Sweatshops meets with UofL administration to demand raising the minimum wage for all contract workers to $10.10/hour (The Louisville Cardinal, Oct. 12, 2015). Success came in December 2015, when UofL announced that the living wage policy has been extended to all full-time contract workers at the university. UofL officials approved a requirement that companies entering contracts with the university must pay their full-time staff a minimum wage of at least $10.10 per hour. Companies currently doing business with the university will be required to meet the new guidelines when their agreements are renewed. The new policy matched one implemented by the commonwealth’s executive branch in summer 2015 that mandates the higher minimum wage for many state government workers and for employees of companies doing business with the state. Universities were excluded from that policy. The Early Learning Campus (ELC) is part of the Gladys and Lewis "Sonny" Bass Louisville Scholar House Campus and is an exemplary pre-school for children of UofL faculty, staff and students, and residents of the Louisville Scholar House. The facility offers extended day opportunities for children aged six weeks to four years. The ELC is located at the corner of 5th and Bloom Streets, across the street from the northwest corner of UofL's Belknap Campus. Hours of operation are 7 a.m. - 6 p.m. According to our Greenhouse Gas Emissions Inventory, roughly 25% of UofL's carbon footprint is due solely to commuting to campus. With the vast majority of commuters driving alone to campus, this represents not only a significant carbon footprint, but a considerable waste of people's time, money, and opportunities for community-building and civic engagement. Providing and maintaining roads and parking for commuters also represents a considerable strain on the University's land and budgetary resources. Learn how walking to campus can benefit the brain, as well as the heart and pocketbook. At New Employee Orientation, we encourage everyone to consider living close enough to campus that they can walk or bike to work with ease. As part of our Climate Action Plan, and in line with our overarching goals of creating more vibrant, livable, walkable, bike-friendly neighborhoods around our campuses, UofL is continuing its efforts to make living close to campus an attractive option for students, faculty and staff. The Sustainability Council is in discussion with area developers about providing mixed-use, mixed-income, environmentally-friendly housing for employees close to campus. One such project, known as The Edge at Liberty Green, will provide such housing within blocks of our Health Sciences Center and within biking distance of Belknap Campus. 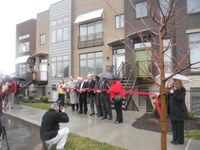 Development continues on hundreds of units of various green-designed housing types and sizes for both purchase or rent. The Sustainability Council invites everyone in the UofL community to explore this exciting, new option in low-impact, healthy, urban living! Staff Senate - Submit your comments. Employee Suggestion Program - Submit a suggestion. CREF Social Choice Account - Invests only in companies that are suitable from a financial perspective and whose activities are consistent with the account's social criteria. Using specific environmental, social and governance criteria, the evaluation process favors companies that are: strong stewards of the environment; committed to serving local communities where they operate and to human rights and philanthropy; devoted to higher labor standards; and those managed in an exemplary and ethical manner. Details here. Fidelity Select Environmental Portfolio (00516) - A growth mutual fund that seeks to provide capital appreciation by primarily investing at least 80% of its assets in the common stocks of companies principally engaged in the research, development, manufacture, or distribution of products, processes, or services related to waste management, pollution control or reduction, conservation or improving the environment, or other environmental concerns. Details here. More information about UofL's employee benefits and our human resources policies are available here. In 2017, as part of the University of Louisville’s ongoing commitment to an inclusive and diverse environment, Human Resources and the LGBT Center expanded the use of a preferred name to employees. Similar to the option available to students since 2015, this new option allows employees to choose a preferred name that will appear in the staff directory, Blackboard, and on their campus ID card. A separate process for choosing a preferred email address (PEA) is also available to employees. Assistant Provost for Diversity and LGBT Center Director Brian Buford noted that a preferred name option promotes a climate of inclusion. “Transgender employees can be accidentally outed when the name in the system doesn’t reflect their identity. And international employees find it easier sometimes to use a name that is easier for American peers to spell and pronounce,” he said. “In both cases, it’s about removing obstacles and sending a message of inclusion.” Read more.